It’s been a memorable season in more ways than one for Raith Ladies, with the team finishing a very respectable seventh place in the 12 team Division One North. Having finished runners-up in Division 2 East two years in a row, the start of the 2018 season brought the unexpected news that the team had been promoted, due to the league winners Bayside abruptly folding three weeks before the season started. Starting the season in a higher league with a very young squad (almost all of whom were under 20) was a challenge, reflected head coach Euan Robertson. “Although the team had great spirit, we were playing games against well established teams with plenty experienced players, meaning even the slightest mistakes were punished,” he said. The team also exited the League Cup in the first round, thanks to an agonising extra time defeat to Boroughmuir. The Scottish Cup exit came in the second round, after a high scoring 7-5 defeat to Inverness, but only after a bizarre first round game away to Buckie. Playing the North League team involved a seven-hour round trip, with several of the squad unable to travel due to work commitments; then with 2 late call offs, the team had to travel with nine players. Incredibly, two early goals followed by “parking the bus” ensured a 3-1 win thanks to a great deal of energy and a fantastic team spirit. With the benefit of experience and some fresh faces coming in, the second half of the season was a different affair. 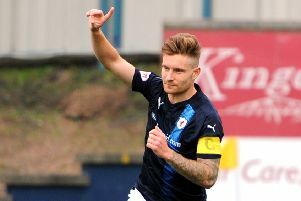 The first game after the break saw Raith win 2-0 against league winners Dundee Utd, Raith being the only team to defeat them in the league the whole season. to consolidate their mid table position. One of the highlights in the second half of the season was undoubtedly the team moving from Windmill Campus to play their home matches at Stark’s Park in early September, with possibly the highlight being a thrilling 2-2 draw with league runners-up East Fife – who had been only just relegated from Premier League 2 the season before. Perhaps the biggest legacy of the past season though was the introduction of a number of players coming through from the under 17s team to play at senior level, giving the club a strong pathway for the increasing number of girls who play football in Kirkcaldy. As Euan reflected: “Our club numbers are now at a record high, with 143 signed players in 10 teams, up from 55 players in four teams only four years ago.